the threats from climate change.” It could spark a revolution in water monitoring. The first buoys were dropped into the bay in 2008, but this infographic offers as clear an explanation of the complex system as we’ve yet seen. The SmartBay buoys conduct various tests on the water, including salinity, temperature, wave energy, tides, dangerous water conditions, weather, purity, and the behavior of various organisms in the bay, including fish and plant life. It then synthesizes all that data, from every single buoy, uploads it to the cloud, where it’s immediately offloaded to an IBM server which analyzes all the information and provides clear, accessible conclusions. That entire sequence happens many times faster than traditional methods of individual tests, manually collected, and it’s having great effects on the myriad uses of the bay, as seen in the graphic above. 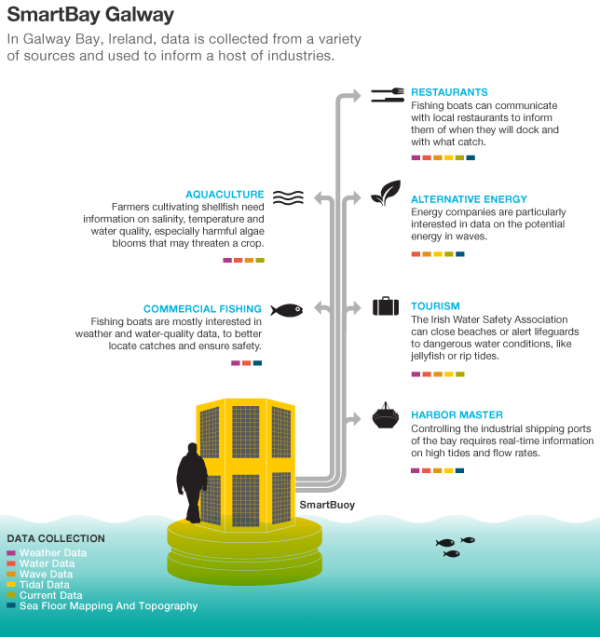 This kind of real-time data collection and analysis helps everybody: fishermen known where fish is, and where dangers lie; energy specialists can study the ebb and flow of waves for potential green energy; lifeguards know the exact behavior of riptides and jellyfish; and shellfish farmers can achieve a more efficient, better crop–all with one system.